Meningitis From Tainted Drugs Puts Patients, Doctors In Quandary : Shots - Health News Public health officials are trying to strike a balance between alerting, diagnosing and treating patients who might be at risk of fungal infections — and not overdiagnosing and overtreating those who aren't at risk. The caution is warranted. This type of infection can smolder for weeks before exploding into meningitis or causing massive strokes. 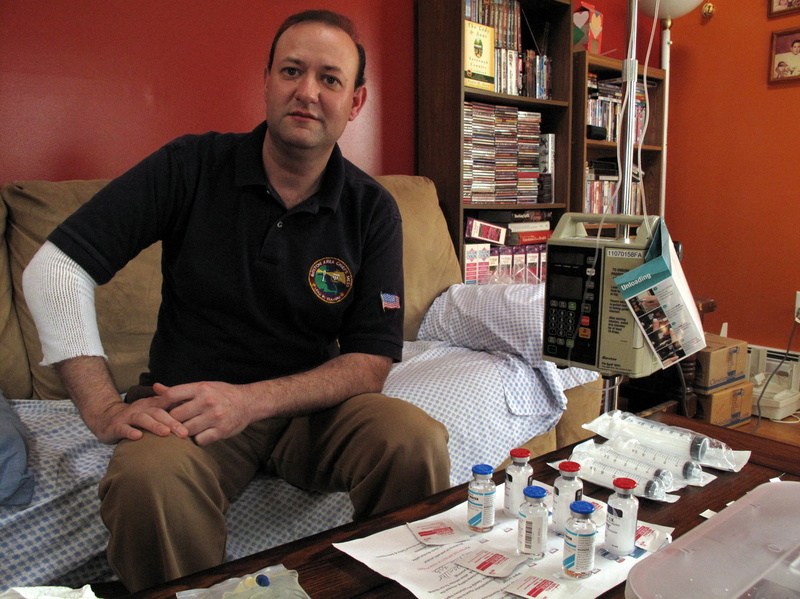 Matthew Spencer receives intravenous infusions of a potent antifungal drug at home twice a day for an indefinite period to treat a suspected case of fungal infection linked to a contaminated steroid drug that came from New England Compounding Center in Massachusetts. Two weeks after Matthew Spencer got a spinal injection for his chronic back pain, he felt "not quite right." Nothing too specific: worsening headache, nausea. Then he saw a TV report on a recall of contaminated steroid medication used for back pain. "I thought, well, I don't know if I had that medicine or not, but maybe I'd better go check it out," Spencer says. It turns out he had gotten one of the tainted steroids. A spinal tap showed possible signs of infection. Since then, he's had to be hooked up twice a day to an intravenous pump for infusions of a potent and risky antifungal drug. He doesn't know for how long. Spencer — the 42-year-old mayor of Somersworth, N.H. — is one of an unknown number of Americans who may become victims of one of the most high-profile episodes of drug contamination in recent memory. So far, the Centers for Disease Control and Prevention has recorded 308 fungal infections in 17 states; 23 people have died of fulminant meningitis or massive strokes. It seems clear the vast majority of potentially exposed people will not become ill — but nobody knows how many will. The CDC estimates that 14,000 Americans received vials of potentially contaminated steroids shipped by the New England Compounding Center since last May 21. It has also warned U.S. medical providers to be alert to illness among patients who have received injections of hundreds of other products shipped by the Massachusetts pharmacy since then. Included in the warning are thousands of patients treated with the company's ophthalmic medications and others exposed to a solution used during cardiac surgery. The CDC has provided no estimate of the total number of patients potentially exposed to contaminated drugs, but the number must run into the tens of thousands. This week the Food and Drug Administration posted a 71-page list of drugs made by the Massachusetts company. Officials say it was really a mini-pharmaceutical manufacturer, not the pharmacy it was licensed to be. That amounts to something like 1,200 different drugs, "a large percentage" of which were injectables. The FDA says patients who have received the company's injectable drugs since May 21 should be contacted by their doctors and advised to be alert to headaches, fevers, chills, stiff neck, nausea and vomiting, sensitivity to light, confusion, numbness and other symptoms. Update at 9:33 a.m. ET: The FDA has reposted the names and addresses of health care providers that have purchased drugs from New England Compounding Center since May 21. A second list includes the products that each health provider purchased. Apparently, all of this has been caused by contamination of drugs by a black mold called Exserohilum rostratum, which is common in the environment but almost unheard of as a cause of human disease. Massachusetts officials said Tuesday that a preliminary investigation revealed multiple problems that could have caused the contamination. For instance, on 13 occasions, they said, New England Compounding shipped out vials of drugs in three suspect lots before getting back results of their own tests confirming the drugs were sterile. The company's records "indicated a failure ... to sterilize products for even the minimum amount of time necessary to ensure sterility," says Madeleine Biondolillo of the Massachusetts Department of Public Health. The firm's premises were not clean, Biondolillo added. "Mats used to wipe dirt, dust and other possible contaminants off of shoes before entering sterile areas were visibly dirty, soiled, with assorted debris," she says. State officials say records indicate that medications were not labeled with individual patients' names, as they are supposed to be under regulations governing so-called compounding pharmacies. Paul Cirel, who represents New England Compounding, says in a statement that Massachusetts officials should not be surprised the company was shipping drugs on a large scale. "It is hard to imagine that the [Massachusetts Board of Pharmacy] has not been fully apprised of both the manner and scale of the company's operations," he wrote. But all this is far removed from the dilemma faced by thousands of patients and doctors caught up in the outbreak and health officials' attempts to contain it. Public health officials and physicians are trying to strike a prudent balance between alerting, diagnosing and treating patients who might be at risk of fungal infections — and not overalarming, overdiagnosing and overtreating those who aren't really at risk. Spencer, the Somersworth, N.H., mayor, is a good example. Although he may harbor a fungal infection that could kill him, there's no proof that he does — and there may never be. Meanwhile, doctors are forced to treat him as if he's infected, out of what public health people call "an abundance of caution." For the same reason, many anxious patients are undergoing painful spinal taps and some are getting antifungal drugs that can damage the kidneys and liver. Dr. Michael O'Connell, who runs a pain clinic where Spencer was treated, says there's no doubt many of these patients are not infected. "It's the perfect mess," he says. "Everybody is pretty frantic these days, seeing lots of patients and being extra-cautious." The caution is warranted. This type of fungal infection can smolder for weeks and months before exploding into meningitis or causing massive strokes. "It causes a quandary for the infectious disease doc to figure out, well, should this patient receive treatment at all?" O'Connell says. "Should they receive full-boat treatment, which would be an IV? Could they instead just be watched very closely with daily phone calls and visits to the office? We just don't know." Experts are working on ways to identify patients who may be most in danger. Some clues are coming from Tennessee, which has had more fungal infections than anywhere: 70 so far. "Some people may be at greatest risk ... because they got inoculated with vials that had been on the shelf for longer periods of time," says Dr. William Schaffner, an infectious disease specialist at Vanderbilt University in Nashville. Tennessee's experience suggests the mold builds up in the contaminated vials over time. So experts are debating whether patients who got older vials of steroids should be treated before they get symptoms of possible meningitis. "Should we do lumbar punctures on those kinds of people so that we can anticipate those that are going to get symptomatic later and beat the fungus to it?" Schaffner wonders. "That is, initiate treatment much earlier, thus averting tissue damage, particularly those devastating strokes." But when to start treatment is only part of the problem. When to stop is also uncertain. Lately, experts have said people may need to stay on antifungal treatments for six months, maybe longer. Spencer, who mixes up his IV medication himself and administers it for hours each day, tries not to dwell on that. "You could probably drive yourself nuts," he says. "You just go day by day, do the best you can do, do what you can do, and get rest."